PLEASE SEE OUR OTHER SITE cgfclocks FOR FEEDBACK. We decided to set up a new shop devoted to antiques and fine interiors as our shop was getting so large. 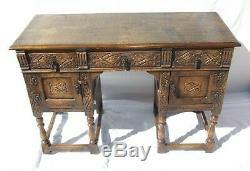 Antique Traditional Carved Oak Desk / Computer Desk / Side Table. 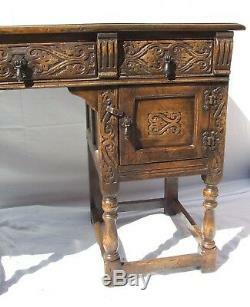 This is an exquisite antique carved oak desk which has the lovely feature of three drawers and two cupboards. 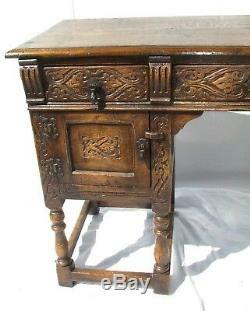 This is a lovely quality piece with nice attention to detail and features such as pegged joints. The desk / side table has a large drawer to the centre flanked by two smaller drawers and two cupboards below. 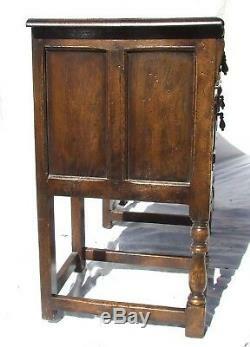 All the drawer and cupboard fronts are nicely carved and have pretty drop handles. The top is made from two plank and has a nicely shaped edge. The piece is then raised on wonderful turned legs. 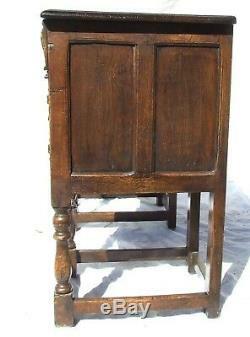 As you move round to the sides these are nicely panelled and even the inside of the knee hole section has been panelled which is nice attention to detail. This piece could be used in many room in the home and add an air of elegance wherever it is placed. 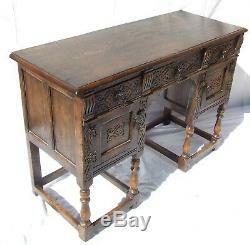 In addition to being used as a desk it could equally be used as a side table / lamp stand with practical storage space provided by the drawers and. The approximate MAXIMUM dimensions are: - 44.75 inches (114 cm) wide. 17.25 inches (44 cm) deep. 30 inches (76 cm) high. 14.25 inches (36.5 cm) wide x. 24 inches (61 cm) high. 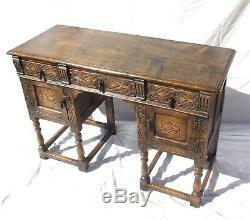 As can be seen from the above dimensions this desk is of lovely proportions. 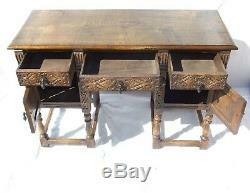 The table is circa 1900. 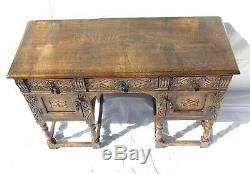 From the photographs you can see that this is an lovely piece of furniture which is in lovely condition, just minor marks commensurate with age and very careful use. If you have time, please check view my shop for other items. For collection in person, cash on collection. If you are unable to collect you are welcome to arrange a courier. The following couriers can provide a quote. Chris Hodge of GEAR SHIFTERS on 07979 603390. Mark Woodrow on 07525 761169. PH Couriers on 01325 365123. Unless prior arrangements have been made all items to be collected within 14 days. ALL OUR CONTACT INFORMATION IS LISTED UNDER. 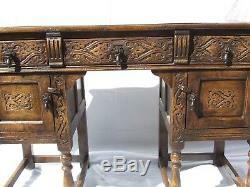 The item "Antique Traditional Carved Oak Desk / Computer Desk / Side Table" is in sale since Monday, May 14, 2018. 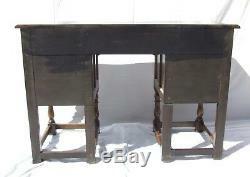 This item is in the category "Antiques\Antique Furniture\Desks\Victorian (1837-1901)". 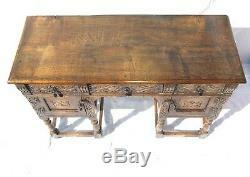 The seller is "awilsonantiques" and is located in Tiverton, Tarporley, Cheshire. This item can't be shipped, the buyer must pick up the item.